Shift to larger farms has reduced average production costs, contributed to expansion of dairy product exports. Congress reorganized dairy policy in the 2014 farm bill when it eliminated three programs and created the Dairy Margin Protection Program (MPP-Dairy). MPP-Dairy was initiated in response to increasing volatility in milk and feed prices, particularly in 2009, when falling milk prices combined with still-high feed prices to impose unprecedented financial stress on the dairy industry. The goal of the new program was to provide farmers with financial protection against risks from increasing volatility in milk and feed prices. According to a newly released report from the U.S. Department Agriculture's Economic Research Service (ERS), these developments occurred amid an ongoing structural change toward larger dairy farms, as well as an ongoing change in dairy product demand away from fluid milk and toward manufactured products sold in domestic and export markets. The ERS report looks at the interrelated topics of changes in dairy production structure, dairy product markets and dairy policy as well as growing price volatility. It also details the major developments in each, traces the linkages among them and identifies the challenges that structural change, evolving product markets and price volatility pose for policy. “The structure of dairy farming has changed dramatically in the last two decades, with cows and production shifting to much larger operations,” USDA noted, adding that these structural changes have likely affected dairy industry competitiveness in world markets. Additionally, it has resulted in a wide range of costs and of financial outcomes, which complicates the design and application of dairy policy, USDA said. According to the ERS report, this structural shift to larger farms has reduced industry average production costs and contributed to an expansion of dairy product exports. However, it also noted that the changes have increased international exposure, which creates new sources of price risks for U.S. farmers. As such, dairy policy has been redesigned in response to these price risks and the changing structure. After decades of consolidation, USDA said half of all dairy cows in 1987 were on farms with 80 cows or fewer. 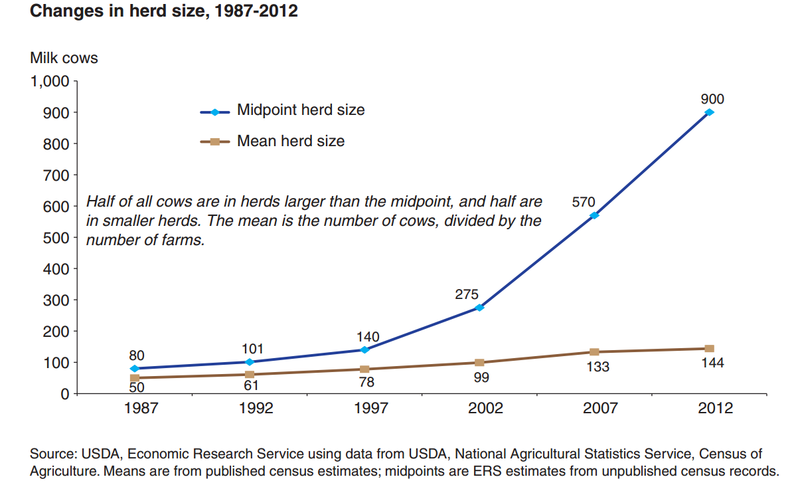 By 2012, that midpoint herd size had increased to 900 cows. “Costs are a driving force behind structural change. The largest farms earn substantially higher net returns per hundredweight of milk produced, and they have strong incentives to expand,” USDA explained. According to USDA, average milk costs of production fall sharply as herd sizes increase, and the largest farms — those with 2,000 head or more — have costs per hundredweight of production that are 16% below farms with 1,000-1,999 head and 24% below farms with 500-999 head. The changes in the size of dairy farms reduced national-average milk production costs by nearly 19% between 1998 and 2012, the ERS report notes. “In turn, lower milk production costs reduced milk prices compared with what they would have been without structural change,” it adds. Still, according to USDA, the evolution of dairy farm structure isn't the only thing changing; U.S. dairy products are also changing. These shifts in the dairy product mix alter the geography of milk production as well as the price risks dairy farmers face, USDA added. The U.S. also has become a major exporter of dairy products such as nonfat dry milk, skim milk powder, cheese, butter and whey. According to USDA, U.S. dairy exports totaled $7.2 billion in 2014 — up from $1.0 billion in 2003. Growing international demand for dairy products (particularly from Asia and Latin America), improvements in U.S. dairy productivity and changes in dairy and trade policies have all attributed to the export market growth. The ERS report says specific features of dairy markets make them prone to price volatility. Price changes have little impact on the milk supply or dairy product demand. Consequently, shifts in demand for dairy products require substantial changes in price in order to reset the supply/demand balance for farm milk. “The dairy industry faced a severe financial setback in 2009, when milk prices fell sharply due to declines in domestic and international demand and feed prices remained high,” the report explains. The margin between milk and feed prices fell to unprecedented lows in 2009, and dairy farmers lost $10 billion in equity — about $150,000 per farm, on average. Additionally, dairy farmers took on more than $4 billion in new debt, largely to finance rather than expand operations, the report says. MPP-Dairy was designed to protect producers from something like that happening again. Participants may receive catastrophic coverage for a $100 enrollment fee that provides payments when national-average margins fall below $4 (the average monthly margin was $8.30 in 2004-13). Expanded coverage, which provides payments when national-average margins fall between $4 and $8, may be purchased for a premium. The ERS report notes that almost 25,000 farms — 55% of licensed dairy operations, accounting for about 80% of 2014 U.S. milk production — enrolled in MPP-Dairy for 2015 coverage, and 45% of those enrollees — representing more than half of the historic milk production of enrolled farms — chose catastrophic coverage for a $100 administrative fee, while 42% of enrollees chose to pay premiums for coverage of $6.00 and $6.50 margins. A crucial issue for MPP-Dairy concerns its effects on milk production, according to the report. “If the program leads to increases in milk production, it can lead to lower average milk prices, and if projected indemnities cause farmers to reduce production less than they might have in response to lower milk-feed margins, it can prolong periods of low margins,” ERS explained. Additionally, while farmers can adjust coverage each year, these adjustments relate only to the share of a farm's production history and the margin that the farm has chosen to cover. “Under current rules, farmers cannot adjust production histories to account for large changes in herd size. Much of the industry's structural change has been accomplished via such changes,” the report says.